10mm Wargaming: Save Land Where our Independence was Won! Campaign 1776, the Civil War Trust’s national initiative to save Revolutionary War and War of 1812 battlefields, is embarking on its most exciting effort yet to preserve the hallowed grounds of our War for Independence. We have an unprecedented opportunity to save 1,037 acres at six sites associated with the Southern Campaign of the Revolutionary War. This is the first national, private-sector campaign to save this critical but overlooked story in American history. By late 1778, George Washington had fought the British to a stalemate in the northern colonies. Looking for victory elsewhere, his foes adopted a new strategy. British generals sent troops south to key ports in Georgia and South Carolina. 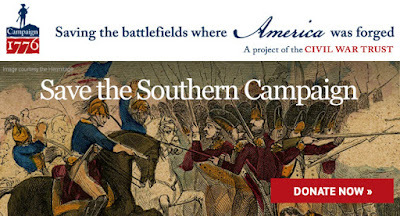 The resulting “Southern Campaign” is one of the great untold stories of the American Revolution. The struggles fought in the southern colonies involved some of the giants of early American history. Edward Rutlege and Thomas Heyward, Jr., both signers of the Declaration of Independence, fought at Port Royal Island. “Light Horse” Harry Lee (father of Robert E. Lee) and Wade Hampton (grandfather of the Confederate cavalry leader) were key figures in the Southern Campaign. Thomas Sumter and William Moultrie earned their reputations defending the South, long before their names were attached to forts in Charleston Harbor. Campaign 1776 is committed to preserving these battlegrounds and—once saved—interpreting the momentous events that occurred on these hallowed fields. Every day, people like you and I drive past these places oblivious to the struggles that raged there. By saving these battlefields, we can use these sites to tell this story of the American Revolution the way it deserves to be told. Help us preserve the memory of this crucial chapter in American history and save the Southern Campaign. P.S. Thanks to an incredible set of matching funds, every dollar you donate will be multiplied by a factor of 37 for a $37.57-to-$1 match. Take advantage of this opportunity to make your preservation dollar go even farther.